Wilmington, Massachusetts, U.S.A.: Houghton Mifflin, 2005. Fine in a very good dj with slight wear. A silver National Book Award Finalist medal affixed to the dust jacket. x, 566 pp., 50 illustrations, map. 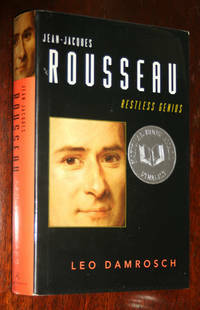 Contents: The loneliness of a gifted child; The end of innocence; "I desired a happiness of which I had no idea"; Rousseau finds a mother; A year of wandering; In Maman's house; The idyll of Les Charmettes; Broadening horizons : Lyon and Paris; The masks of Venice; A life partner and a guilty secret; A writer's apprenticeship; The beginnings of fame; Rousseau's originality; Lionized in Geneva, alienated in Paris; An affair of the heart; The break with the Enlightenment; Peace at last, and the triumph of Julie; Rousseau the controversialist: Emile and the social contract; Exile in the mountains; Another expulsion; In a strange land; The past relived; Into the self-made labyrinth; The final years in Paris. "Jean-Jacques Rousseau was a teenage dropout who ran away from a hated apprenticeship, spent the next twenty years in apparent idleness punctuated by occasional low-level jobs and until he was well into his thirties seemed to have no future whatsoever. But then, unexpectedly even to those who knew him best, he became one of the most influential writers of his time and, as it would eventually turn out, of the modern world. Rousseau's triumph was the more surprising since, unlike most famous writers then or later, he did not go to school for a single day and was essentially self-taught." --from the introduction. . First Edition. Cloth. Fine/Very Good. 8vo - over 7¾" - 9¾" tall.